View cart “Weight Loss Probiotic – Gut Bomb 350 Billion (Ultra Potency & Multi Strain)” has been added to your cart. Thyroid Daily Essentials is a five-in-one multivitamin designed specifically with thyroid patients in mind. This formula contains a multivitamin, a fish oil capsule, a 30 billion CFU probiotic, a therapeutic dose of magnesium, and a therapeutic dose of Vitamin D3. All of these vitamins and nutrients are essential for thyroid function and can help at multiple levels of thyroid function in your body. Do you need a multi-vitamin if you have hypothyroidism? I’ve been critical of multivitamins in the past, but that mostly has to do with the fact that most people use them incorrectly. Multivitamins for your thyroid should be used in a very specific way and should contain all of the ingredients known to help support thyroid function. First on the list is an array of basic vitamins and minerals. These vitamins and minerals help to replete low levels of nutrients which are necessary for thyroid function. Thyroid Daily Essentials contains ALL of these minerals and vitamins and they all come in their pre-methylated and highly usable form. Second is a therapeutic dose of Magnesium. Hypothyroidism (as well as hyperthyroidism) disrupt normal magnesium metabolism in your body. Because of this, it is necessary to include a higher than normal dose of magnesium in a multivitamin. The third is a therapeutic dose of Vitamin D3. Vitamin D is critical in regulating your immune system and promoting healthy thyroid function. And massive amounts of people are deficient in this important nutrient! The only problem is that supplementing with extremely high doses can potentially cause calcium dysregulation and other issues. Thyroid Daily Essentials contains the optimal amount of Vitamin D3 in each serving. Fourth is a strong dose of Fish Oil. Fish oil can help promote weight loss and helps regulate the inflammatory process in your body. This is important for ALL thyroid patients because inflammation is a driver of reduced T4 to T3 conversion. Fish oil should be staple for many thyroid patients and Thyroid Daily Essentials contains an iFOS certified fish oil with both EPA and DHA. Fifth is a high-quality 30 billion CFU probiotic. Lastly, the gut plays an extra special role in helping to regulate thyroid function because it is the place of about 20% of T4 to T3 conversion for the entire body. Gut-related issues can reduce thyroid conversion and lead to persistent hypothyroid symptoms in many patients. Thyroid Daily Essentials contains all of the nutrients, vitamins, in the exact amounts that I recommend for thyroid patients to help enhance thyroid function at every level. Thyroid Daily Essentials comes in individual packets and each packet contains 6 capsules. This packet is designed to be taken on the go if necessary. For best results, take 1 package (6 capsules) each day in the morning after breakfast. Thyroid Daily Essentials can be taken on an empty stomach but most people tolerate it better with food. If you are taking thyroid medication, be sure to take Thyroid Daily Essentials 30-60 minutes AFTER your medication ( do not take them at the same time). This supplement is designed to be used on a daily basis and can be used consistently or intermittently as needed. If you’ve never used a high-quality multivitamin before then you would likely benefit from using this multivitamin daily for at least 2-3 months. This will allow your body to build up the necessary storage of all essential vitamins and nutrients. At the 2-3 month mark, you can either continue using it daily or switch to an as-needed basis. It’s ALWAYS a good idea to continue to come back to a multivitamin, however, because the chances are high that you will develop suboptimal nutrient levels over a period of weeks to months. Can this be taken with my thyroid medication? All of our supplements are designed for thyroid patients which means they can be taken with your thyroid medication (and yes that includes NDT, T3 only medications, T4, and so on). We do, however, recommend that you avoid taking this supplement at the same time as your thyroid medication. For best results use this multivitamin at least 30-60 minutes after you take your thyroid medication. Can this be taken with your other supplements? This formula is specifically designed to be used in conjunction with our other supplements including Thyroid Adrenal Reset Complex, T3 Conversion Booster, Thyroid Hair Regrowth Complex, our probiotics, and Functional Fuel Complete. The blend of ingredients and the dosages found here pair perfectly with these supplements. Does this multivitamin contain iodine? Each packet contains 50mcg of iodine as potassium iodide. Iodine is REQUIRED for all humans because we can’t make it on our own. And as long as iodine is taken in conjunction with selenium, zinc, and other nutrients, it’s safe for your thyroid. 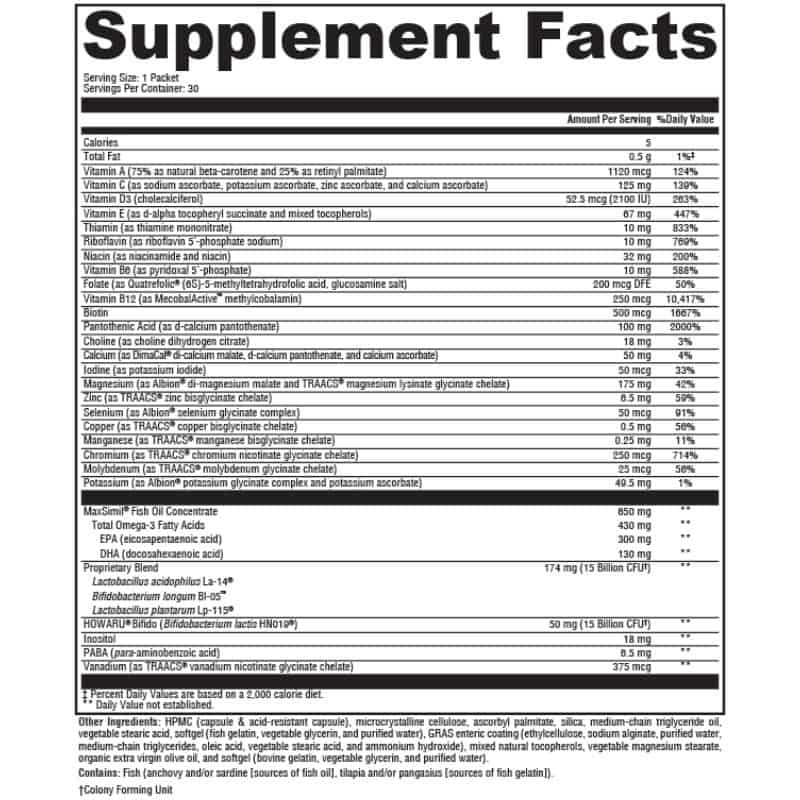 How long should I take this supplement? If you are new to supplementing for your thyroid then using this daily for 2-3 months is a great place to start. This will allow you to replace all lost nutrient levels in your body and build up a storage. From that point on you can use it as needed or continue using it daily (there is no harm in using it daily after that point). All product orders to the United States receive free shipping. We ship out within 1 day of your order (unless you order on the weekend) and it takes approximately 1-3 days to reach the destination depending on how far you live away from Arizona. All supplements are shipped with free shipping via first class mail through USPS but you can upgrade to priority mail if you prefer as well. We offer international shipping as well! You can calculate the price of shipping at the checkout page (we do not mark up the cost of shipping) and currently we ship to all countries. I love how you get 5 different pills for a very good price. They were quite effective for my issues. Although, I probably won’t repurchase because I am trying to make the transition to obtaining all of my vitamins and nutrients through Whole Foods now. But it was truly great for while I was still in the “supplement” stage. Everything you need in one convenient packet. I really appreciate this essential daily base product. Only 6 small pills and it is compatible with all the other products so there is no guesswork. Feeling very well balanced since I began taking this supplement. I love the daily packets it makes the process easy breezy. Hi Catherine, Thanks for sharing and glad you are enjoying it! I am feeling better since being on these products. I probably have tried everything out there and these are great! Hi Jacquelyn, Awesome! Thanks for sharing and I'm glad they are helping. This wasn’t originally what I imagined when I saw it was in a sachet I thought it was a sachet of powder like to mix in a drink but it’s a sachet full of pills. There are some larger pills in it if you have an issue taking pills be warned. The value for money of the combination is fantastic and makes my life so much easier. I highly recommend this. Hi Fay, Sorry that wasn't more clear! Yes, each sachet contains 6 capsules. I'm glad you find it valuable, though!